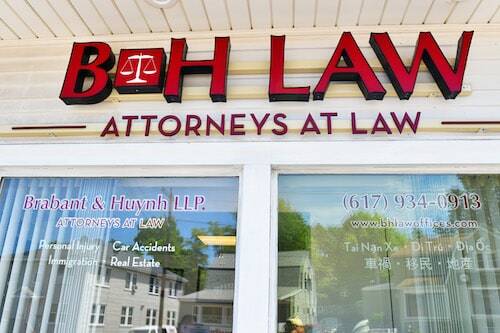 Brabant & Huynh is a trilingual law firm with offices located in Quincy and Dorchester while serving the area of greater Boston and being retained by clients throughout the Commonwealth of Massachusetts and represent clients throughout all the counties within: Suffolk, Norfolk, Essex, Plymouth, Middlesex, Worcester, Berkshire, Franklin, Hamden and Dukes County. Our law firm comprises a trusted team of attorneys who offer valued advice and high energy representation applying their professional services to help those in need when legal issues arise and confront them. We speak English, Vietnamese, Chinese (Mandarin and Cantonese) and Spanish to communicate with you and serve you. And as we are a multilingual law firm, our approach in representation is manifold as well: We are committed to representing and protecting the rights of injured victims and handle a full spectrum of personal injury cases. Specifically, our trial firm represents people who have been injured by a car accidents, truck accidents, motorcycle accidents, slip and falls, construction accidents, dog bite injuries to extremely severe injuries and wrongful death cases. If you have been hurt or injured as a result of some accident, call our firm and we will fight to get you the compensation for your injuries, medical expenses, lost wages, rehabilitation costs and pain and suffering that you are entitled to and deserve. We will call, e-mail and even text if you prefer, on a regular basis to keep you apprised as to the status and progress of your case so you will always know what is going on. We pride ourselves on staying in frequent contact with our clients and incorporating them into the details of their case so they understand every step of the process. When you've suffered an injury because of another's negligence, carelessness or wrongdoing, you should be certain not to speak directly to the insurance company before you've sought the counsel and advice of an experienced attorney. Our Personal Injury attorneys will be your aggressive and cunning advocates, fighting on your behalf to get what you deserve. If you have suffered an injury that has caused you physical, mental or financial losses, you deserve to be justly compensated and by choosing the Quincy Personal Injury attorneys at Brabant & Huynh as your representatives, we will make sure that you are justly compensated. All of our injury cases are taken on a contingency basis which means we take no fee until we successfully settle or try your case in court. Call us today for a free consultation. Pay no fees until recovery. Millions of dollars won for personal injury victims. Personalized attention with quick call backs, emails and texts. We are here to serve your legal needs. The second prong of our practice is the representation of buyers and sellers in real estate transactions. At Brabant & Huynh, our Real Estate attorneys bring extensive legal acumen to help individuals, businesses and families resolve real estate transactions and financing. We represent buyers, sellers, investors and businesses relative to residential and commercial real estate as our firm has handled many residential closings throughout the Commonwealth of Massachusetts. As Dorchester Real Estate attorneys, we have the required experience and wherewithal to serve our clients interests throughout the transactional process. Each client will work one-on-one with one of our attorneys, not with support staff, from the beginning of their case until its closure. Our services range from drafting, negotiating and reviewing Purchase and Sale Agreements or leases, doing a title review and title clearing issues while prepping for the issuance of the title insurance policies. During the course of real estate closing process, we compile and collate all of the closing documents, settlement statements and handle closings for lenders. The Dorchester Real Estate Attorneys at Brabant and Huynh have a firm understanding of Real Estate and the laws affecting each transaction and are ready to help in accomplishing your Real Estate goal. Please contact us to discuss your Real Estate needs and how we can help at (617) 288-9400. Our attorneys add valued assistance and provide critical insight into advising small to mid-sized businesses and entrepreneurs relative to business formation, e.g. general partnership, limited liability company, limited partnership, or a corporation. Electing the suitable business structure helps set the tone for the overarching business strategy and helps minimize the risks inherent in business ownership. The Dorchester Business Attorneys at Brabant and Huynh have a firm understanding of businesses and the laws affecting them and are ready to help you establish and grow your company. Please contact us to discuss your business formation needs and how we can help at (617) 288-9400. Personalized attention with quick call backs, emails and texts here to serve your legal needs. A critical and highly valued prong of our practice relates to helping the immigrant community relative to their needs; specifically aiding individuals in obtaining family based Green Cards while bringing families together, whether they be from abroad or are on this side of the pond. In this day and age, the importance of obtaining ones legal permanent residency is truly a top concern for many in the realization of the American Dream. The Dorchester Immigration Attorneys at Brabant & Huynh believe in this dream and seek to help those in this time honored pursuit. If you are engaged or married and you and your fiancé/spouse needs the assistance of counsel to navigate the legal minefield that is the immigration process, please call the attorneys at Brabant & Huynh to seek the valued assistance of an experience immigration attorney. The Dorchester Immigration Attorneys at Brabant and Huynh have a firm understanding of naturalization process and the laws affecting todays immigrant community and are ready to help you on your path to citizenship. Please contact us to discuss your Immigration needs at (617) 288-9400. Our attorneys have a varied professional background of experience that informs their practice. As counselors at law who are dedicated to putting our clients first and providing them with on-point representation, while making sure each client is updated and well educated in the decision making process. Our firm's abiding philosophy is that the 'client is the boss' and we cater to their needs by listening acutely to the relevant facts as they know them and then digging deeper to discover the unknown aspects of the case to ensure the best possible result. We invite you to call us today at (617) 934-0913 to schedule your initial consultation. You can also chat with our online secretary or complete our online contact form. One of our experienced attorneys will always handle your case directly, ensuring you receive the experience, skills and resources you deserve. When you retain Brabant & Huynh LLP as your legal counsel, you will always be our top priority because we place the highest importance on our client's satisfaction and aggressively advocate on their behalf to win awards and negotiate settlements that fairly and justly compensate them for their loss. We serve the following localities: Norfolk County, Quincy, Brookline, Plymouth County, Brockton, Plymouth, Suffolk County, Boston, Middlesex County, Lowell, Cambridge, Newton, Somerville, Framingham, Waltham, Malden, Medford, Worcester County, and Worcester, Bristol County, New Bedford, Fall River, Essex County, Lynn, Lawrence, Haverhill, Hampden County, Springfield. How Much Can I Get From my Car Accident Settlement? Fill out the contact form or call us at (617) 934-0913 or (617) 288-9400 to schedule your free consultation.